And so it began. The Great Australian Roadie, the 12,000 oddessy across this great southern land, a once-in-a-lifetime overland journey of epic proportions from sea to shining sea …. It was a shame, therefore, although strangely appropriate, that we got lost leaving Sydney. although in truth it could have also been because I was busy whooping and hollering and giving victory salutes having just discovered that the cruise control I’d spent the past two days installing actually worked. I was also put out, truth be told, at the lack of any sort of official send-off to herald our departure. A minor civil delegation of some sort would have sufficed. The local mayor, or even a councilor. But no. We packed everything we owned into the back of Chuck the Truck (putting everything that wouldn’t fit onto the roof), said goodbye to the safe warm haven of our apartment and eased our over-laden Nissan Pathfinder gently out and into the traffic on a wet and grey Sydney day. Oh well, the longest journeys start with the smallest step, right? After our unscheduled diversion through Western Sydney we pointed Chuckie north and hit the freeway. Astoundingly nothing fell off the roof and we didn’t have any accidents leaving the city this time (another story). 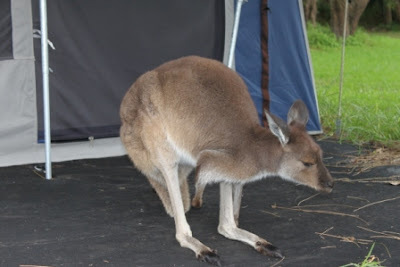 We did, however, manage to misjudge the amount of time it would take to get to our first overnight stop, the beautiful hamlet of Port Stephens, around three hours north of Sydney as it turns out. Consequently we got to experience putting up our brand-new tent in the dark. The girl assured me she’d owned a tent of this type before, and to leave the whole thing to her, so I went off to unpack the car. Upon returning, she was still frowning over the various sets of poles that came in an assortment of lengths and colours. After an unsuccessful attempt at claiming the set of yellow poles were “spares’’ the girl rallied and with the aid of a set of instructions which I dug out of the tent bag we got the thing up without getting too wet. Oh did I mention it was raining? That was enough drama for one day so we spent today exploring Port Stephens. 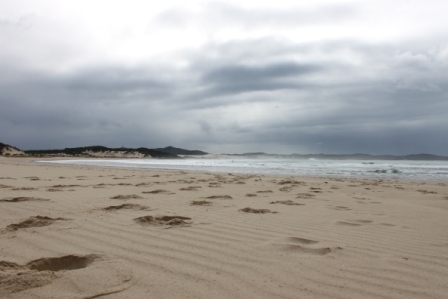 The area is famous for its shipwrecks, sharks and sand dunes but unfortunately all three were nowhere to be seen in the rain. Stockton Beach has some of the best beach 4WDing in NSW but to my disappointment it was closed due to massive storms that have made the beach unsafe for driving. You can also go whale-watching in Port Stephens but to be honest, if you’re Mainlanders like we are, you can’t go past Kaikoura. Plus, we both have itchy feet. We want to head north, out of NSW, out of the rain and cold, out of winter. The plan is to get as far north as Woli on the northern NSW coast tomorrow before hitting Byron Bay for a spot of surfing and hopefully some sunshine in the hippie capital of Australia.